The Association of Students of African Heritage (ASAH) in The Netherlands cordially invites you to the fourth edition of Black History Month on 18th and 25th February 2011. ASAH was founded by and for students who can directly and indirectly distract their roots from Africa and for those who have affinity with the African continent. ASAH activities are geared on providing members with opportunities to further develop themselves on a personal, professional, social and cultural level during the course of their studies. The activities organized by ASAH include Black History Month, Movie nights, Africa Rising, Social Lounges, Excursions and ASAH’s first trip abroad to London in 2010. The Student Association is based at the Erasmus University in Rotterdam. Many African and Afro-Caribbean countries are endowed with resources that could stimulate economic stability and independence. However, many of those are plight by economic inefficiencies coupled with a constant dependence on global resources. For example, “one may see a black woman elegantly clothed with traditional attire. But her cloth may be from Vlisco (the Dutch manufacturer of African prints), shoes/slippers from Italy and earrings/jewelleries from Thailand. Instead of local manufactures many prefer Hollywood movies over Nollywood/Ghallywood/Black films or even opt for Indian Basmati or American Uncle Sam rice instead of locally cultivated rice etc”. Considering the trends of commerce, “to what extent are we (Blacks) economically independent when we portray the African/(Afro-) culture”? • Through the conceptualization of culture and what constitutes the African/(Afro-) culture, a “Black Cultural Expert” will enlighten us with reference to the theme. The expert will talk about various developments in the Black culture over the years. During the fashion show, information will be provided about the attires, their origins, designer etc. • Entrepreneurs: After the fashion show, Mrs. L. Echtelt of Mariposa Import, will share her views on “Black consumerism and entrepreneurship”. • Cultural treats/snacks: There will be cultural snacks to enjoy. Information will be provided about the ingredients used, its origin, the caterers and/or where to buy them. • There will also be a spoken word performance by T. Martinus. The day ends with a Musical performance! 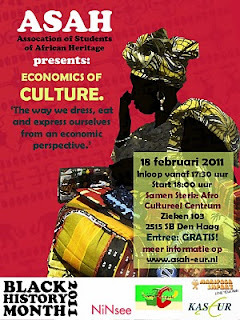 The second day of BHM 2011 consists of a workshop and an interactive presentation at the Erasmus University. • Workshop: To encourage the youth and BHM participants of African heritage to take initiative to become entrepreneurs, Ms. W. Gillis-Burleson – managing director of Legato B.V. and the best Black Business Woman 1997 – will give a workshop on empowerment and entrepreneurship. This workshop aims to equip participants with some fundamental knowledge, tools and skills essential for business for starters. • Presentation: Mr. T. Kofi – Director of the Foundation Africa Next Door – will talk about the consumption trends of Black people and its consequences. 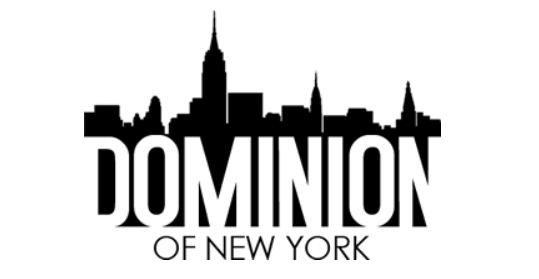 Mr. Kofi will show the correlation between the African continent and Black communities worldwide. Participants or the audience will have an opportunity to ask questions or share their opinion. Amongst others, there will be a debate/discussion on “Does our culture inhibit us to enterprise?” during the discussion round.